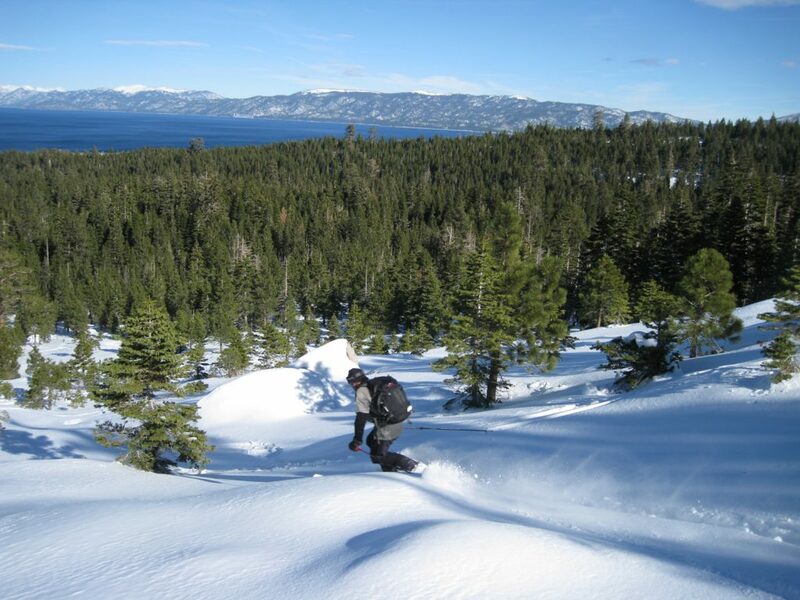 We want to ensure permanent, sustainable winter access to the Tahoe backcountry. Read on below to learn about the most requested projects. Rubicon is a unique mountain in both beauty and attributes that has been overlooked by land managers, yet it is a short-list favorite for locals and tourists alike. 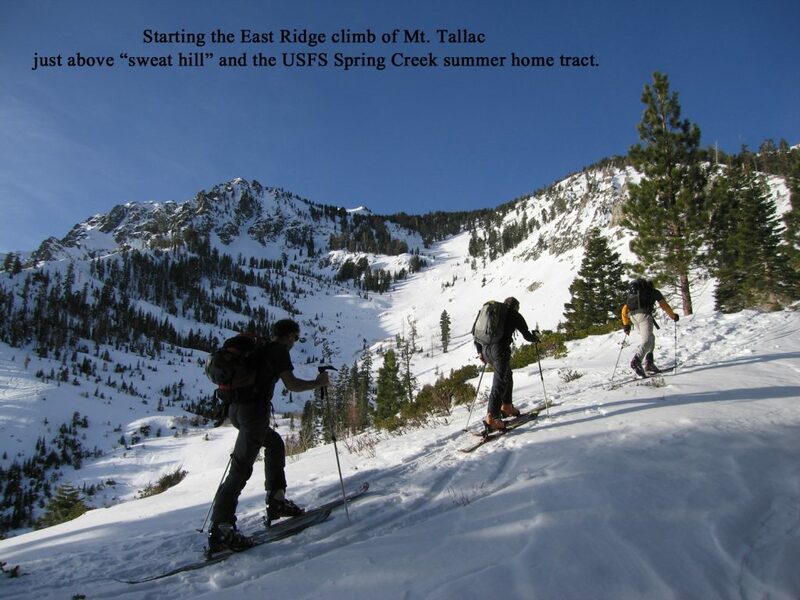 People hike a steep 2000′ user created summer trail, that becomes a coveted ski tour route up the north ridge. The route starts 700′ above hwy 89 at the end of Highview Court. Currently about 10 cars fit in the dead end before the gate. There are no homes on this short and steep street. 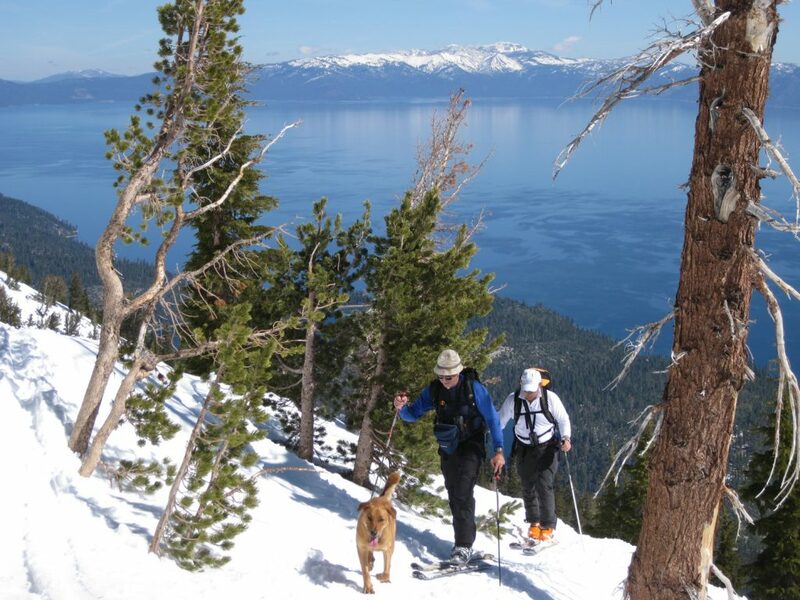 In times of deeper snowpack, people might prefer starting at the lake elevation and extending the adventure. There are only occasionally one or two car pullouts plowed down there unfortunately. We propose a parking plan that includes both locations to spread people out and also offer a different experience based on fitness levels and varying snow coverage. The highway elevation parking down low would require building a parking lot and certainly make more sense for summer use. The upper parking area is practically usable as is if we could just get rid of the locked USFS gate and add pavement. TBA is pursuing a cost estimate at this time. This upper parking lot would move the vehicles completely out of sight of residents and offer nearly level terrain to park on. There are not many residents using the homes in this neighborhood in the winter and the county plows them very reliably. Locals have asked why they can’t we park behind this gate for decades. TBA has been asking for help from land managers to develop a Rubicon parking lot plan since our first day, and we have had a number of offers to look into the issues preventing progress on this project. However all we know at this point is that the Highview Court dead end has an old USFS locked gate on a country road, blocking an El Dorado County owned flat dirt area originally graded to install a large water tank above it. 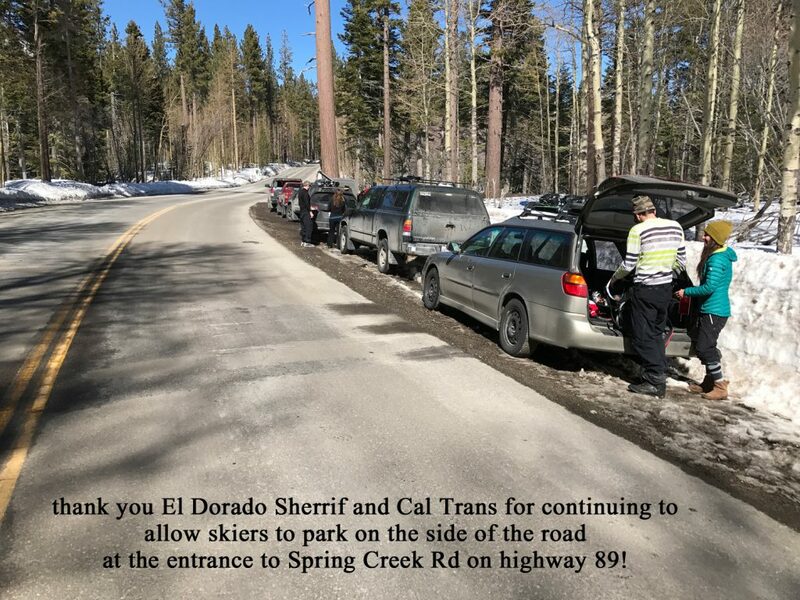 El Dorado Sheriff Matt Underhill has told us that he does not want skiers to be ticketed while parking up here to ski Rubicon Peak. The public obviously has to take their chances getting towed or ticketed if they block snow removal machines. Most local skiers can recall days when cars were ticketed even though all snow plowing has been done. And you would likely get a ticket if you tried parking anywhere else near this mountain, even down on the highway in a Cal Trans pullout. El Dorado and Placer County both have a NO PARKING Nov 1 – May 15 rule on all roads. 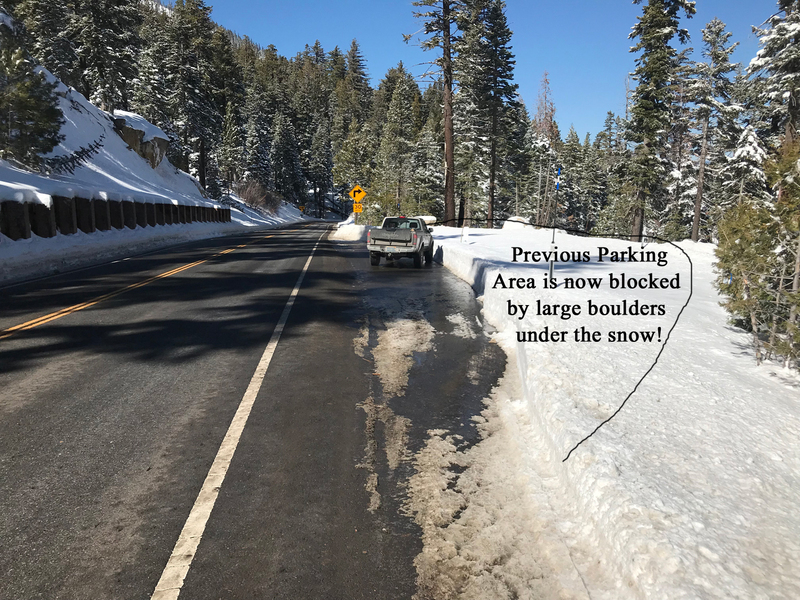 California Highway Patrol officers generally say that they will not ticket anyone who is parked beyond the snow stakes anywhere. That is not always possible, and tickets still do get written regularly for parking during Nov to May regardless of the snow removal status. This rule was born in response to the huge winter of 1982, when local Fire and Rescue managers fought one lane roads. TBA recommends more signage and a modified parking rule that in certain locations states “no parking when snow removal conditions exist”. There are a few very old signs like this in El Dorado County. 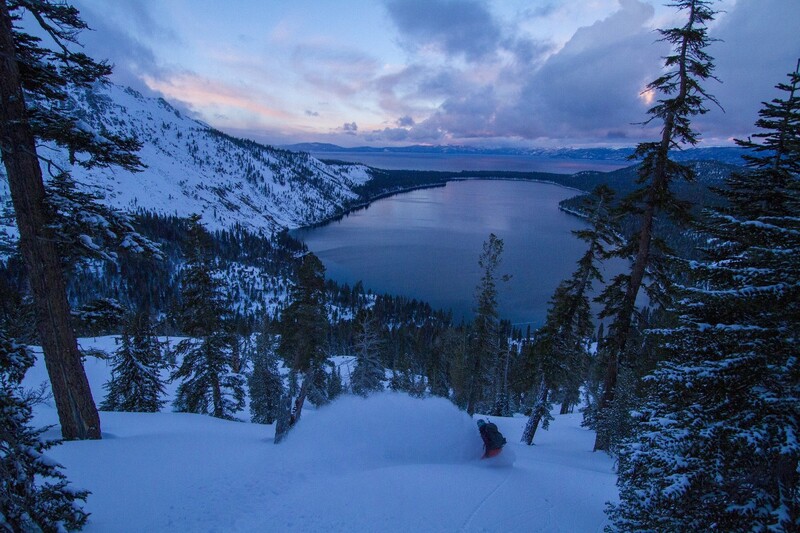 Why do we love Rubicon Peak? Offers crowd relief from popular Jake’s Peak 1 mile south. Reasonable half day ascent time. The mature forest provides enough spacing for intermediate level skiers. 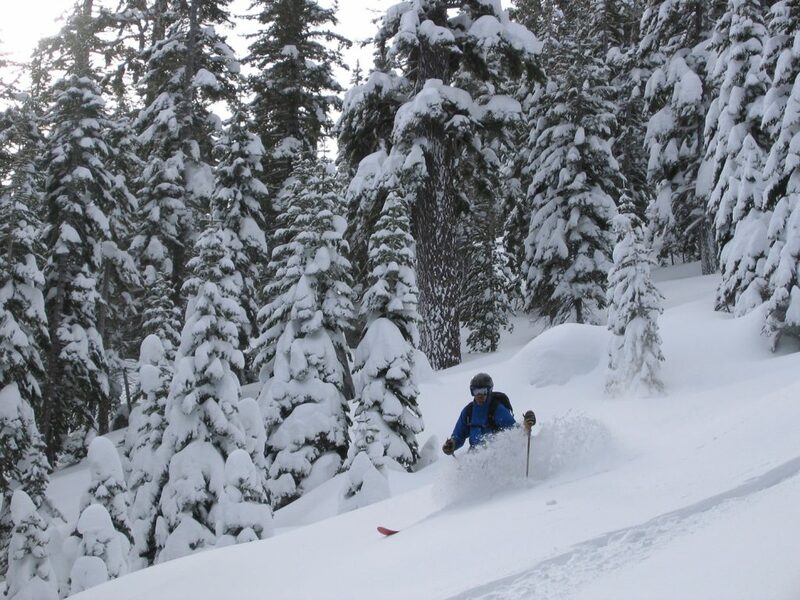 The widespread old trees also add to very low avalanche danger by protecting snow layers from excessive sun and wind. 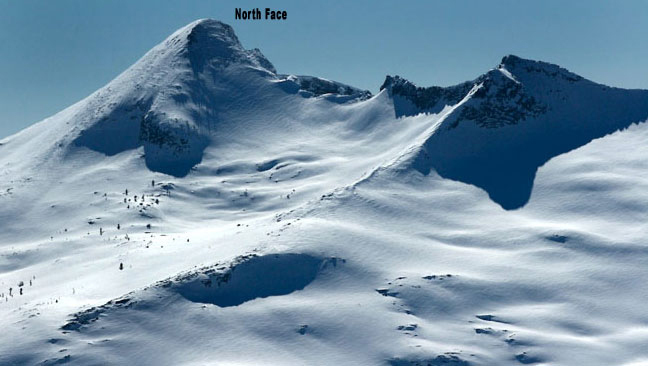 No steep terrain and few possible Avy starting zones. Superior full 360 view from a the only technical summit in Lake Tahoe. Still a great view if you don’t climb the 100′ summit rock outcrop. 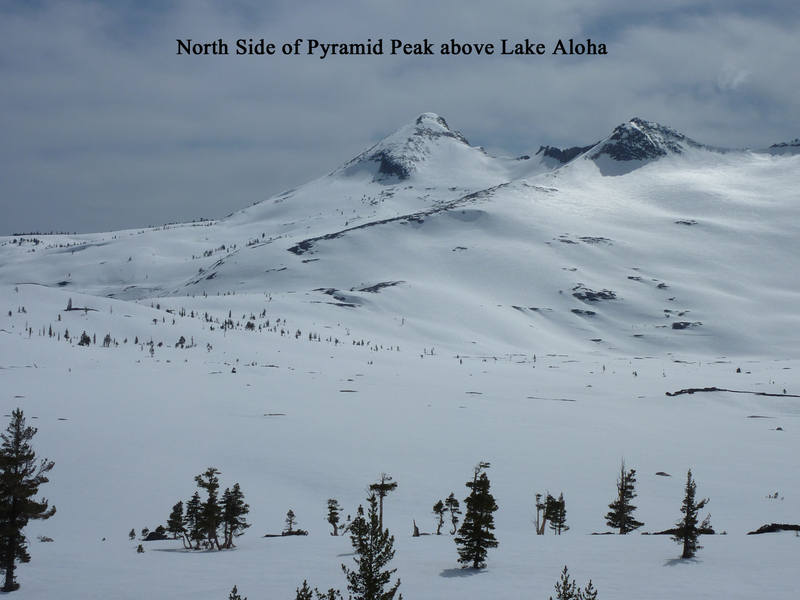 Access to northern Desolation Wilderness in the Phipps Peak area. 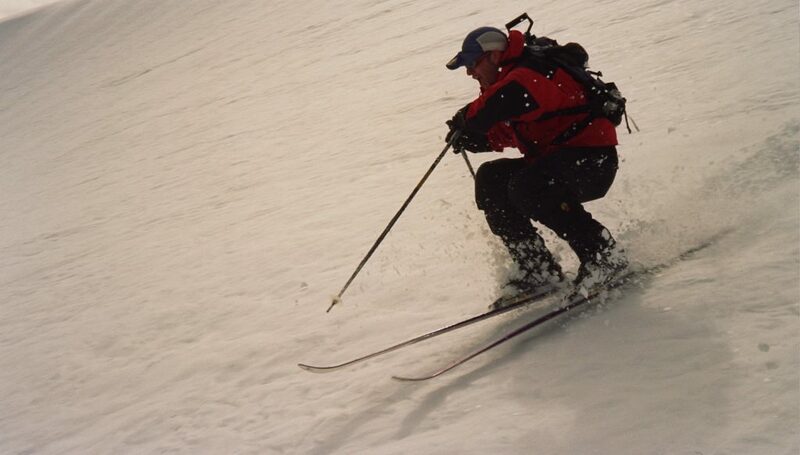 Wide season for skiing due to common early snow coverage. And hey, it’s a classic! 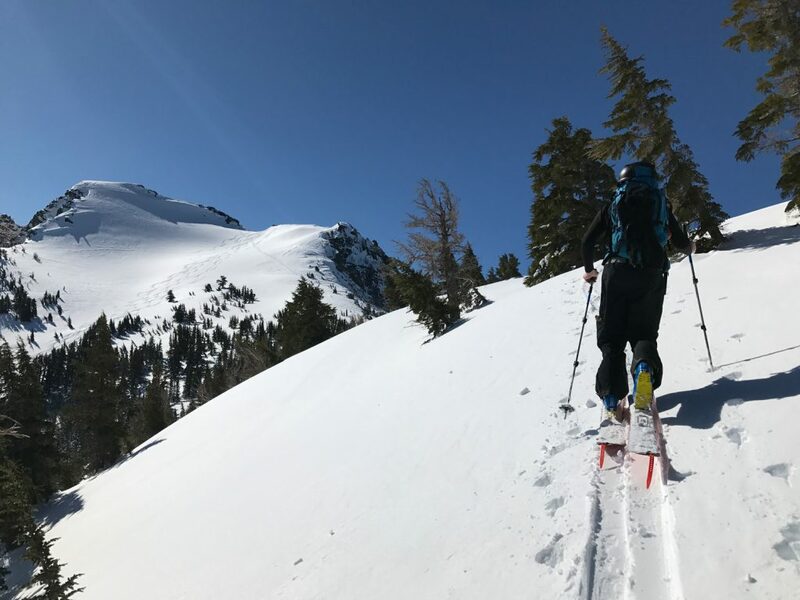 People have enjoyed backcountry skiing Rubicon Peak going as far back as the equipment has been available – long before ski areas were built in the Tahoe area. So how do we get access to Rubicon Peak? For starters, click the button below to send an email to land managers. 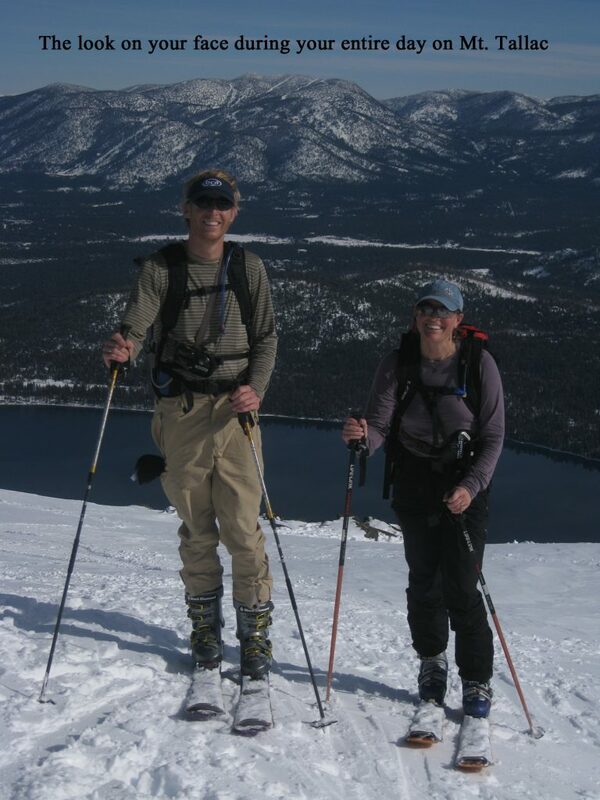 Tallac is THE best backcountry ski touring experience in the Tahoe Area. Mt. 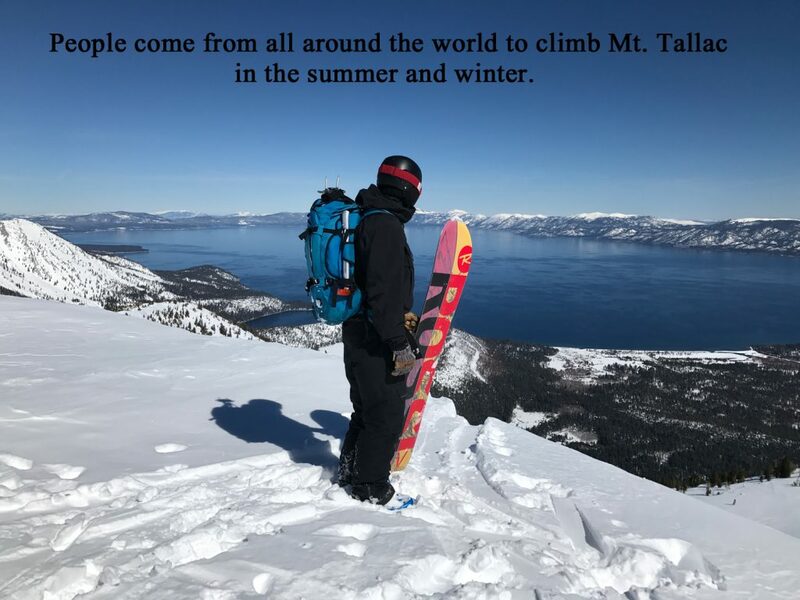 Tallac will be an experience you will never forget. 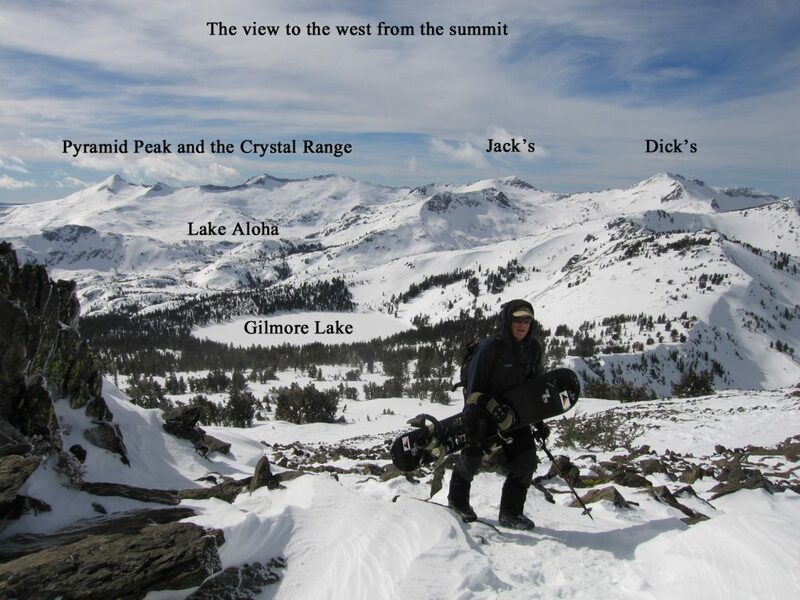 The 360 degree views from the summit are unsurpassed and require no technical climbing. 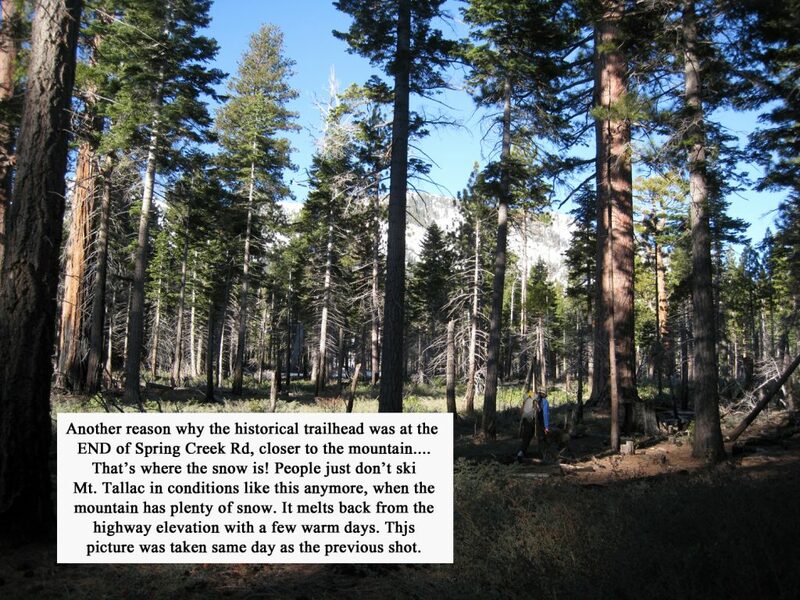 The summer trailhead is poorly located for winter access, but sees 50-100 people per day in the summer. Half of them probably make the 3200′ climb to the top. 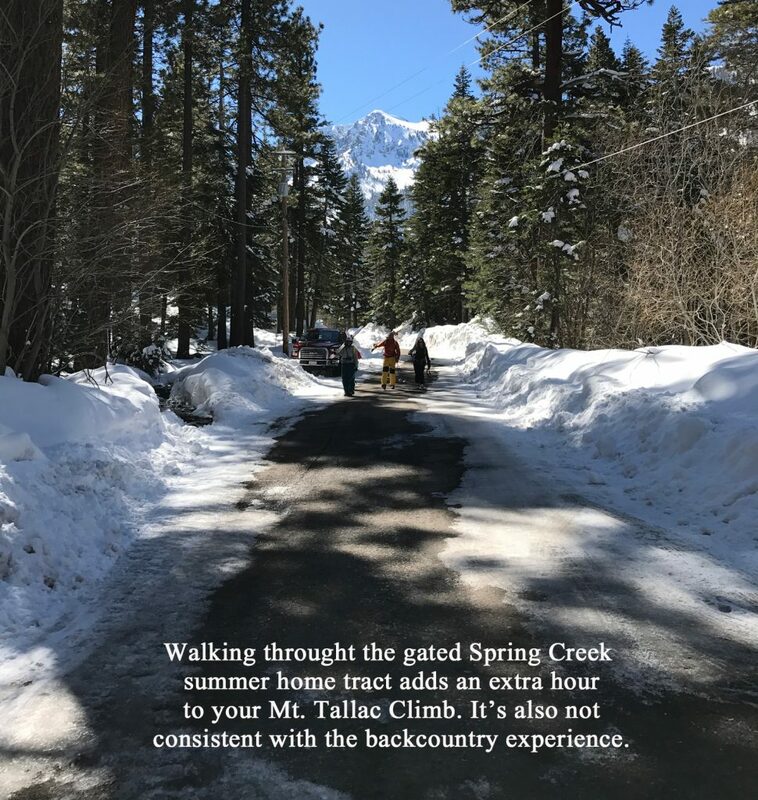 Before we lost our access to the unofficial winter trailhead at the end of Spring Creek Rd, you would see nearly the same number of people climbing the mountain on most sunny days in winter and spring. The huge and varied slopes of Mt. 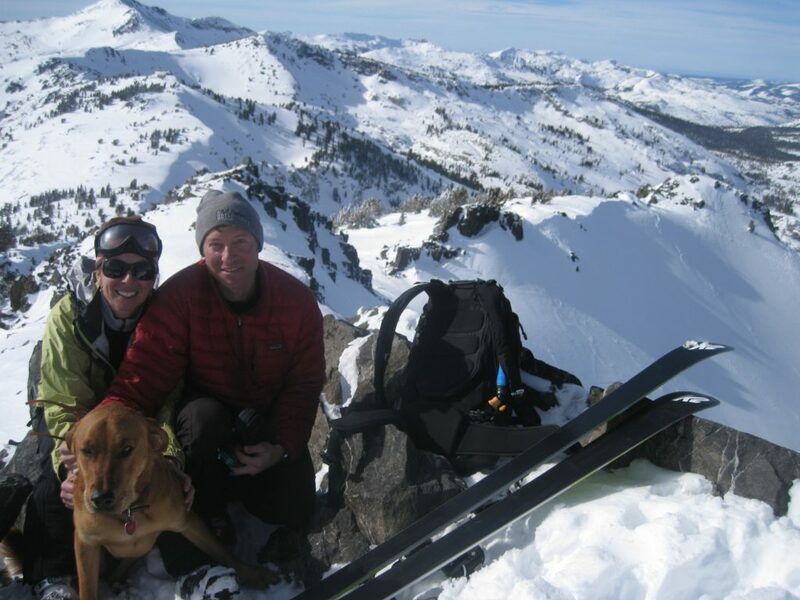 Tallac are perfect for skiing. 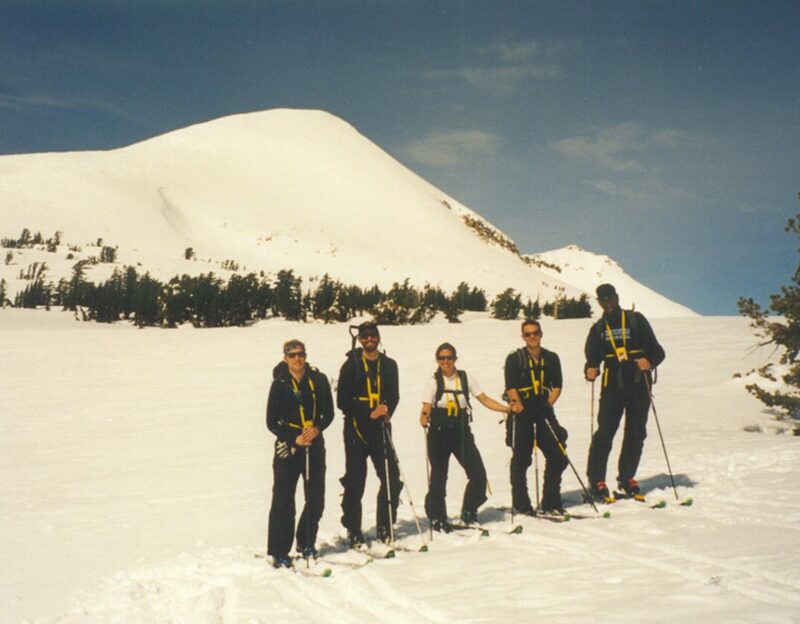 These days only the hardy backcountry skiers try to climb Mt. Tallac because of the additional hour travel time to get into the woods. And skiers have to guess where to park along hwy 89, hoping the car will be there when we return. We we haven’t heard of any one getting tickets, as the highway sees a lot of sun for snow melt. There is plenty of room to park on both sides of hwy 89, just south of the entrance to Spring Creek Rd. 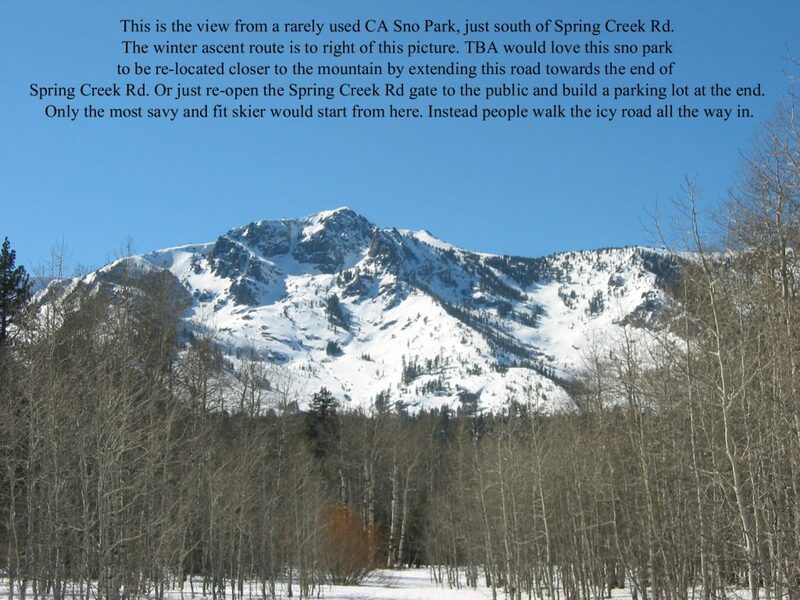 TBA would like to see USFS provide a winter access parking lot for Mt. Tallac near the old, gated historical trailhead. This would allow an east ridge approach, which is the only safe and efficient way to go up there. 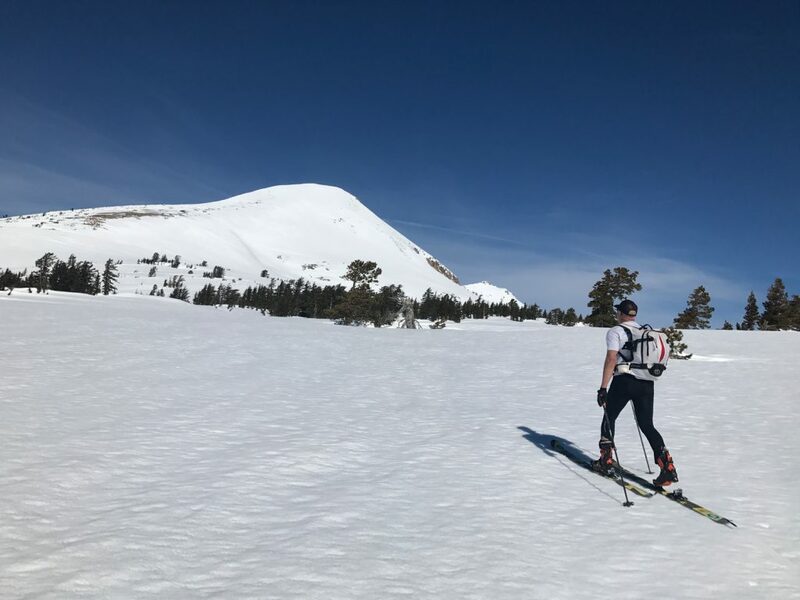 And one that doesn’t require marching through the icy streets of the spring creek summer housing tract for an hour with our skis on our backs like we currently do. The gate used to be open at hwy 89 which allowed some messy parking back there, but skiers never bothered anyone. 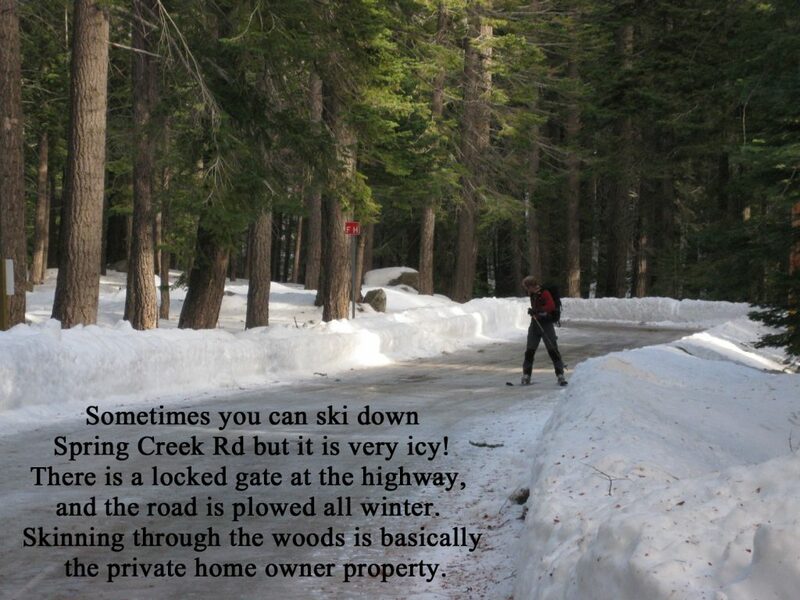 In fact the forest lease summer cabins at the end of the road are rarely if ever used in the winter. TBA would recommend a new location and paved road possibly just a few hundred yards south of Spring Creek Rd. 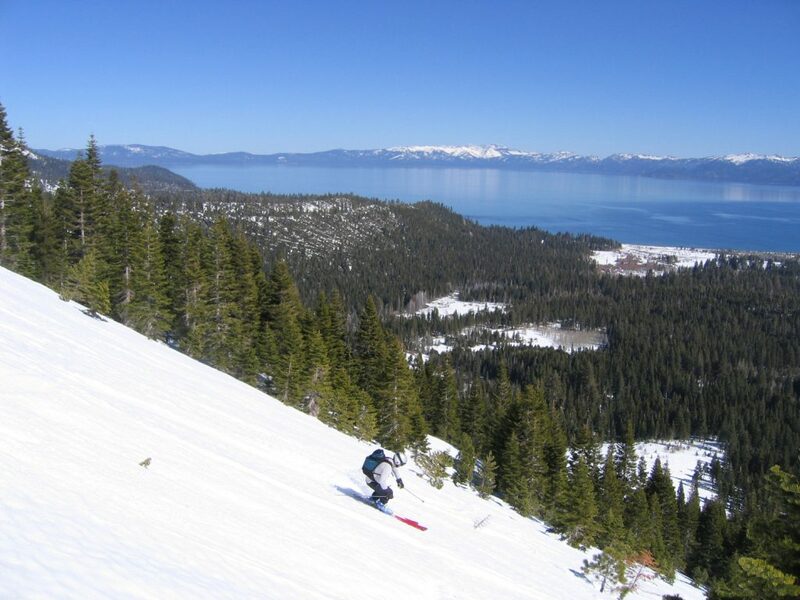 It could potentially be an extension of the abandoned CA Sno Park at hwy 89. Or how about in the woods just beyond the end of Spring Creek Rd? The forest is flat back there and the road is plowed all winter. Mt. 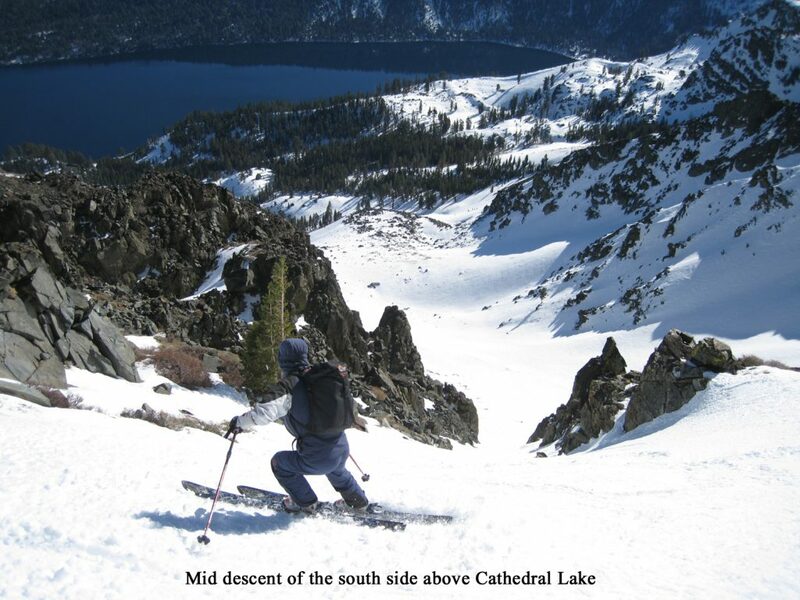 Tallac has been enjoyed by backcountry skiers long before the local ski areas were built. 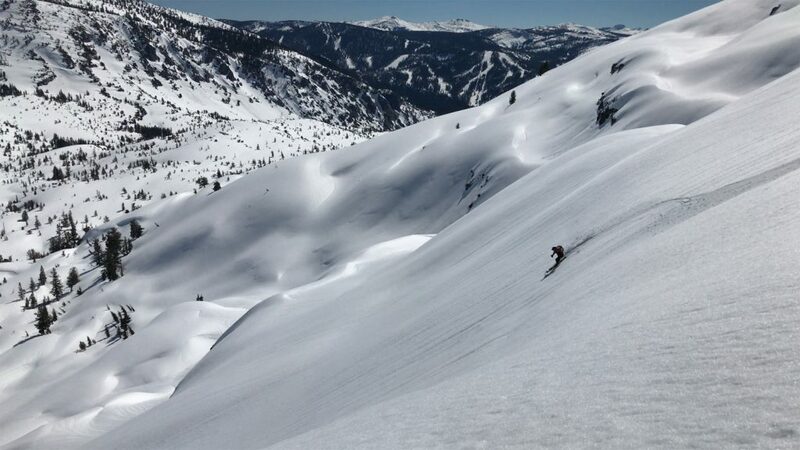 You can find spring corn and winter powder on different slopes on the same day. There are popular tours around Mt. Tallac that explore the south, east, and north sides. Mt. 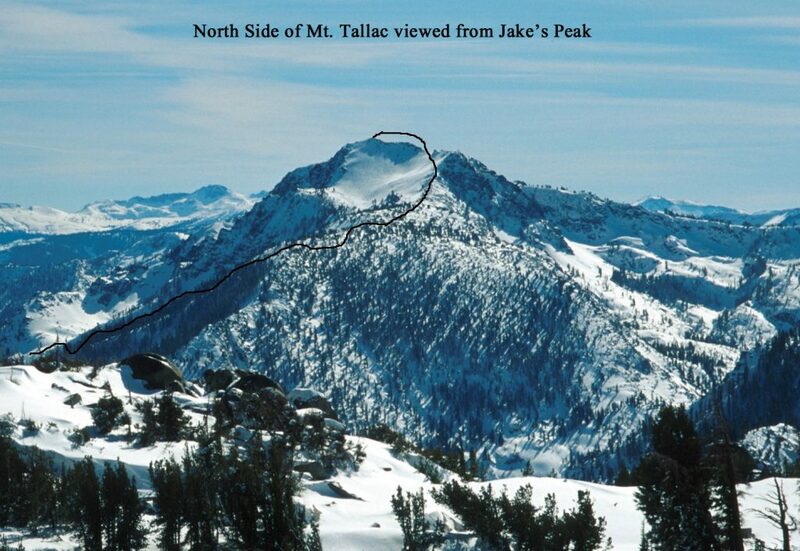 Tallac is the most accessible big peak in Desolation Wilderness. 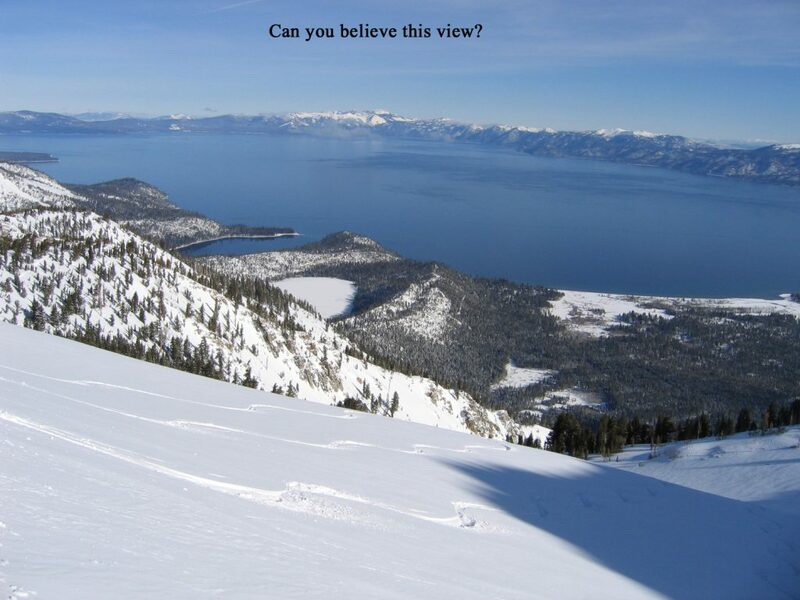 The Lake Tahoe Chamber of Commerce commonly uses an inspiring picture of Mt. 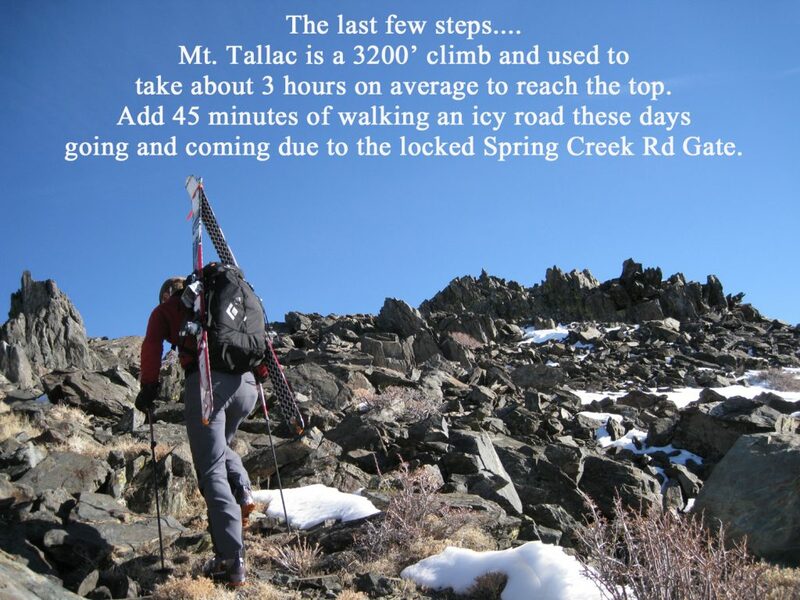 Tallac in their marketing. Yet you can’t legally park anywhere to access it in the winter. So how do we get access to Mt. 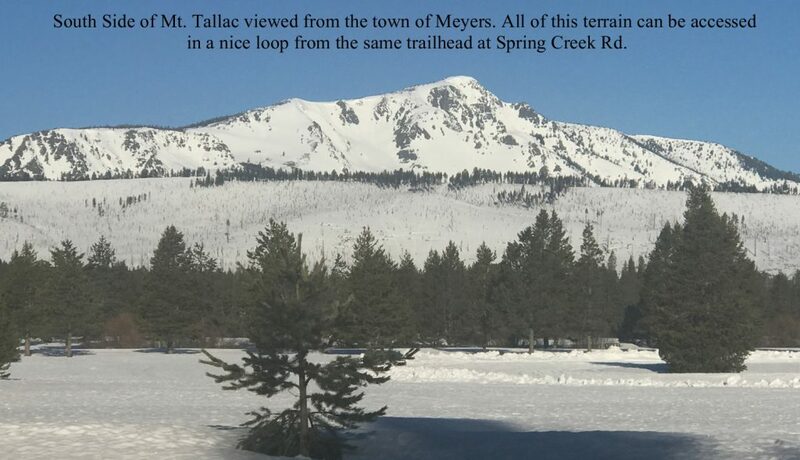 Tallac? For starters, click the button below to send an email to land managers. 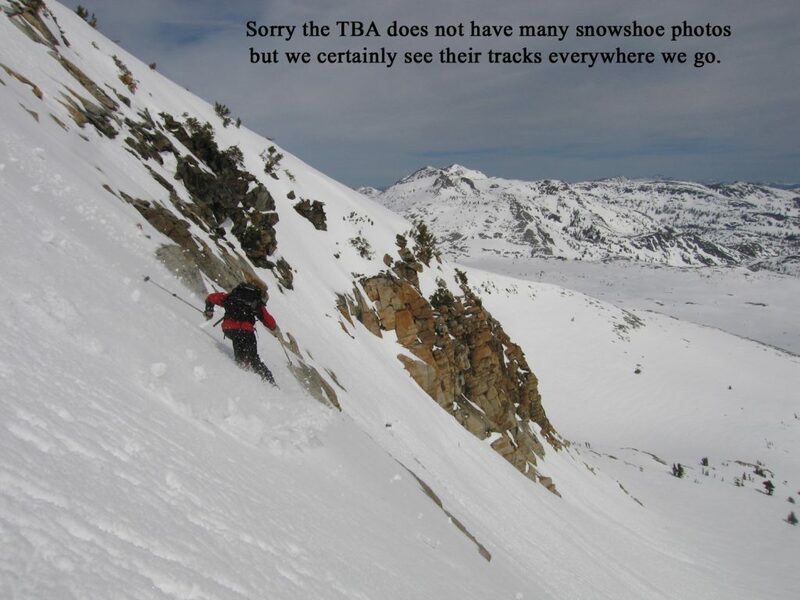 Pyramid Peak is emblematic of the common winter-access issues the TBA is trying to resolve. 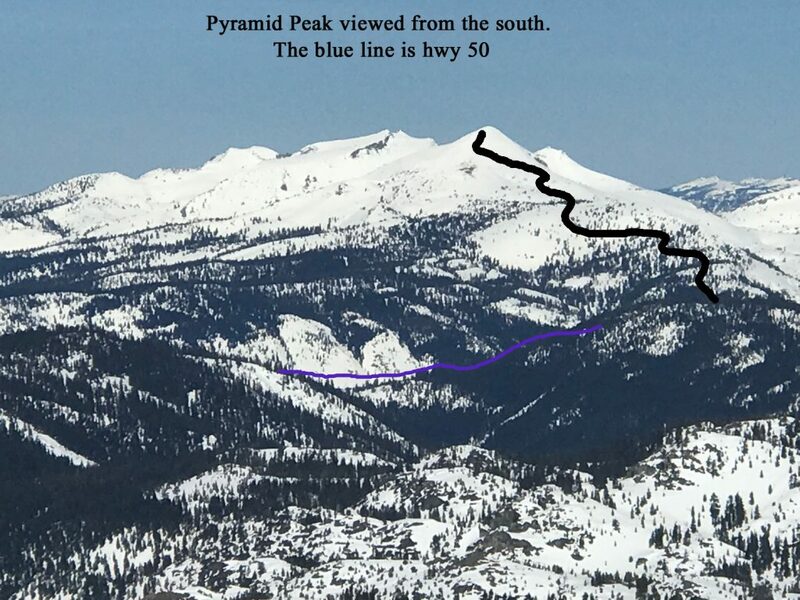 Pyramid Peak is not a popular ski tour destination, but it certainly should be when the snowpack finally covers the low elevation slope along hwy 50 at Horsetail Falls. 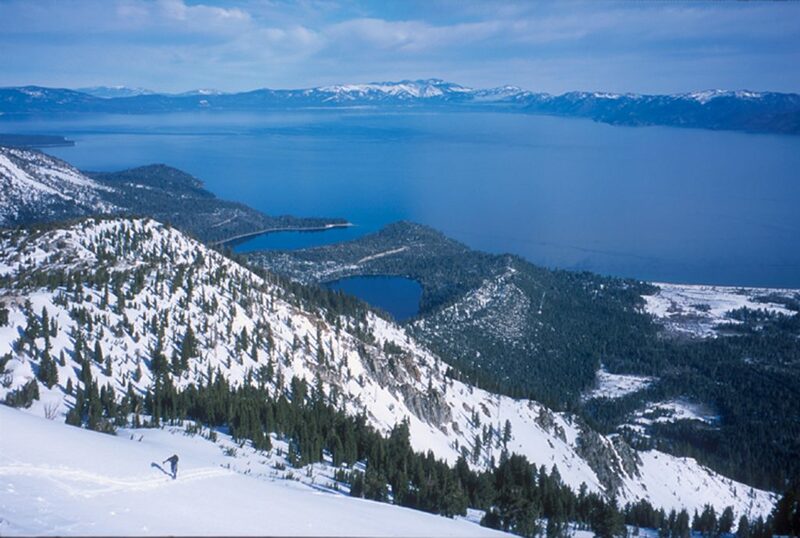 This is the longest summit climb in Tahoe at 4000′ from car to summit. The terrain is quite friendly, safe, and low angle as you ascend the south side. Most people trying to access the mountains in this area are going up smaller, neighboring Ralston Peak. There is no parking there either, but that’s another story. 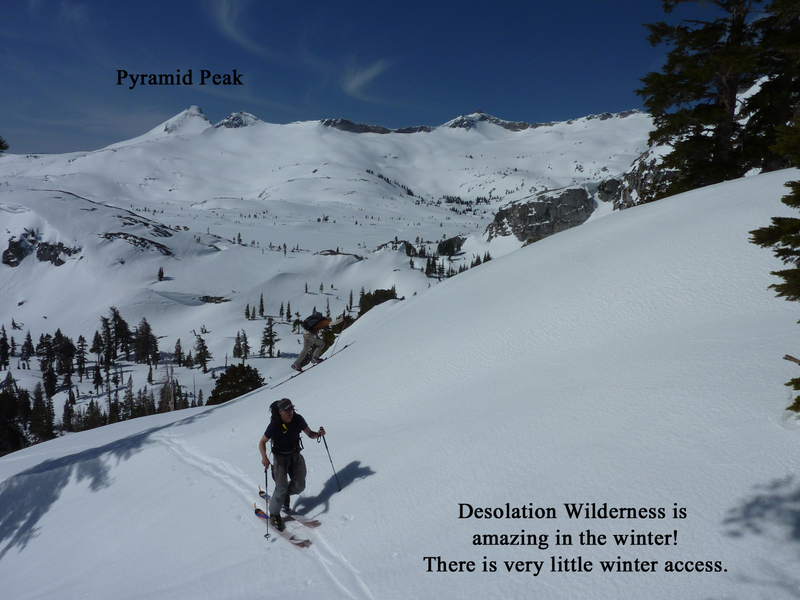 You can see the entirety of Desolation Wilderness from the summit of Pyramid Peak and can choose a steeper ski descent on the north and east sides as well. 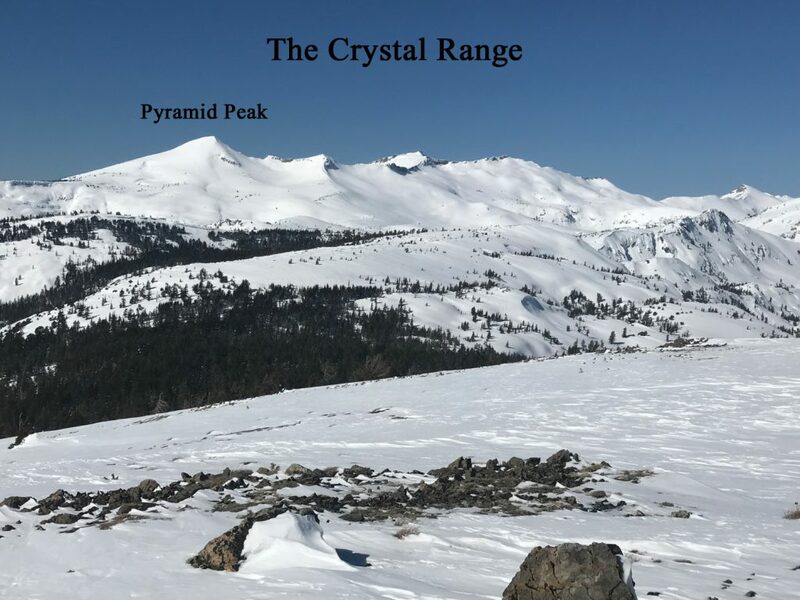 Like Rubicon Peak, there is no established summer trail or parking area for the largest mountain at the south end of the Crystal Range, which is the impressive and iconic formation above Aloha Lakes in Desolation Wilderness. Locals know this peak is not to be missed, and generally look forward to an early spring climb when you can skin from the highway. Or we just slog through some bushes for a few minutes, either way works! You could park 50 cars along the huge wide highway, if not for many signs that say no parking. Why can’t you park here? TBA recommends more signage and a modified parking rule that in certain locations states “no parking when snow removal conditions exist”. There are a few very old signs like this in El Dorado County. 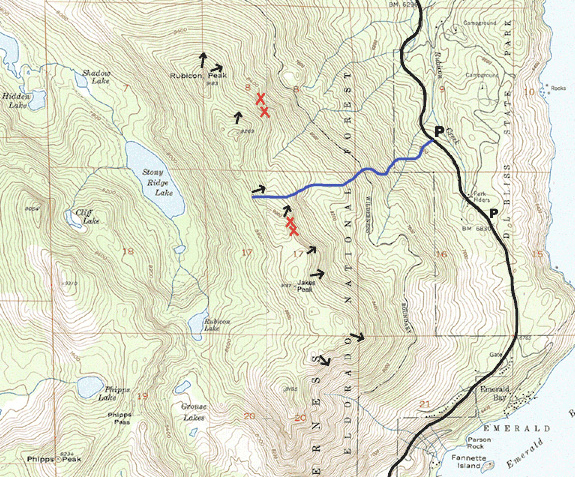 There is also a popular summer trailhead up Horsetail Falls that would work fine, but it is gated and unplowed. Honestly this parking lot doesn’t need to be opened or plowed. There is always plenty of room to park along the highway if we weren’t worried about getting towed or ticketed. 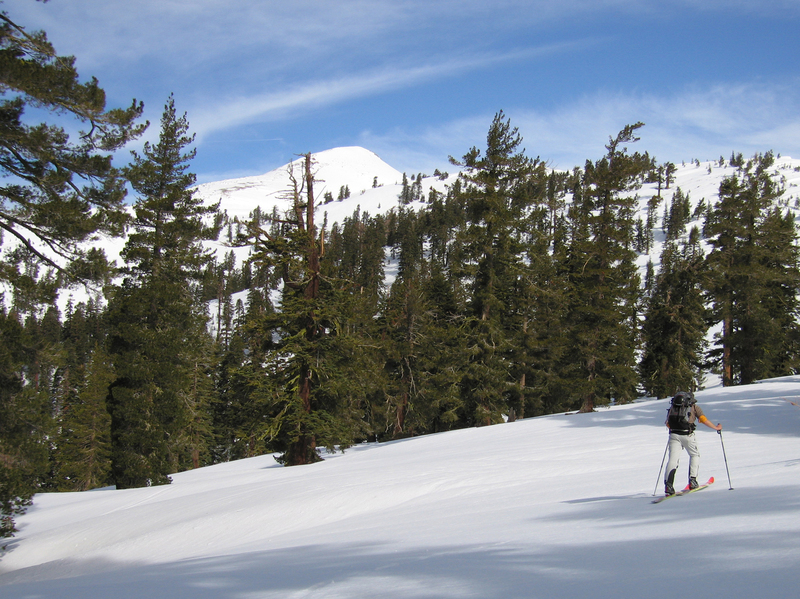 TBA would like to see land managers provide parking to backcountry skiers and snowshoers. 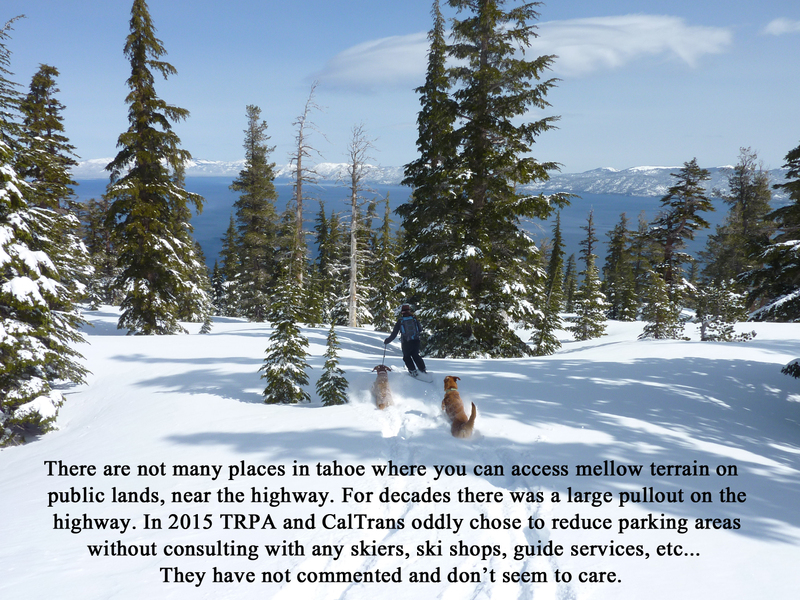 People want to access our public lands, especially Desolation Wilderness. Locals who know how to sneak in these incredible experiences go anyway but take their chances. Would you climb a few hours to a mountain top in the winter if you weren’t sure your car would be there when you return? 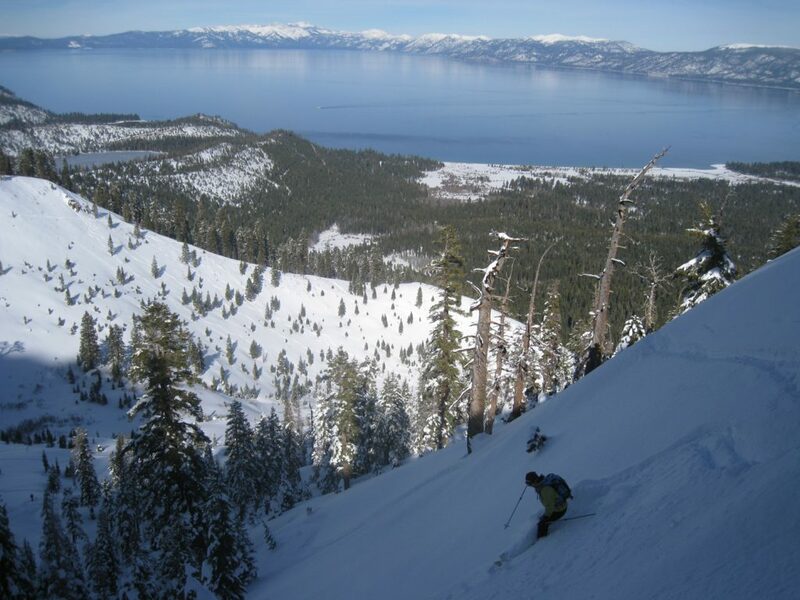 TBA is further convinced that the local economy would greatly benefit from more skier access in the backcountry around Lake Tahoe and Desolation Wilderness. 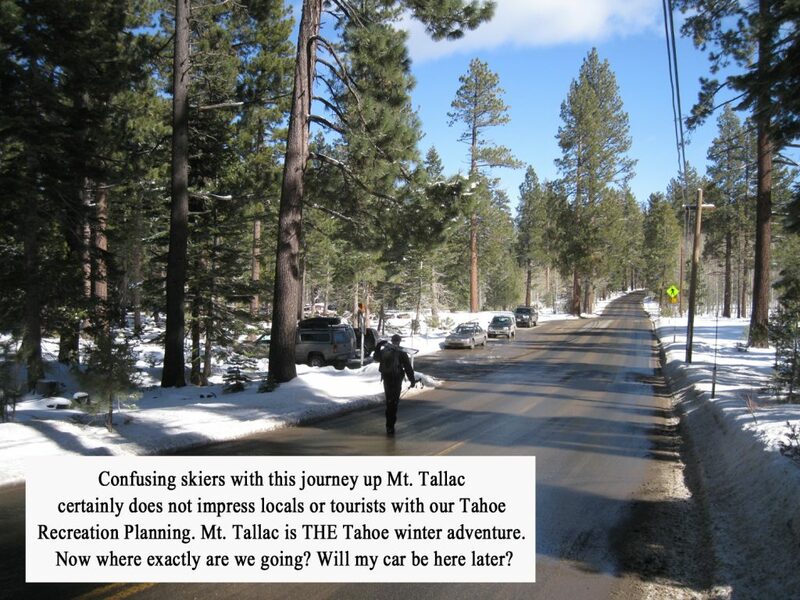 And spreading people around to different mountains will reduce congestion and enhance the Tahoe experience overall. This is the reason most of us moved here in the first place. 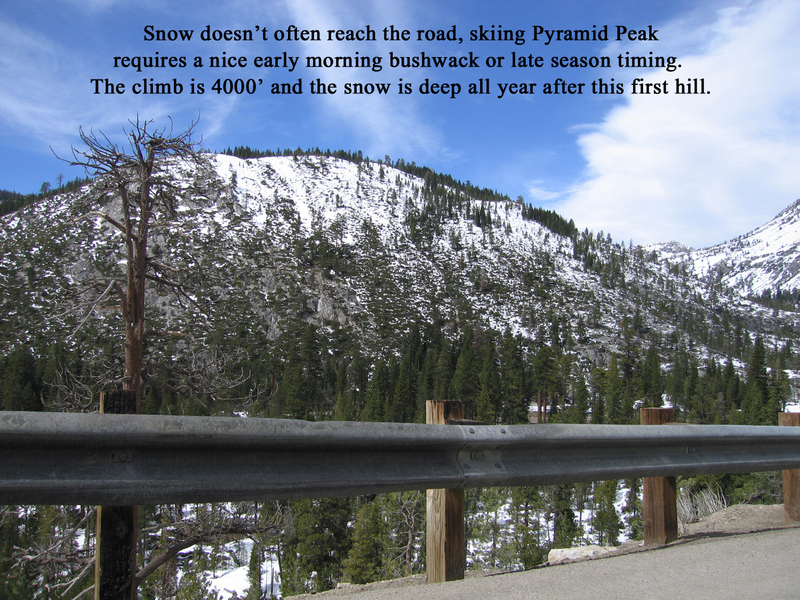 So how do we get access to Pyramid Peak? For starters, click the button below to send an email to land managers. 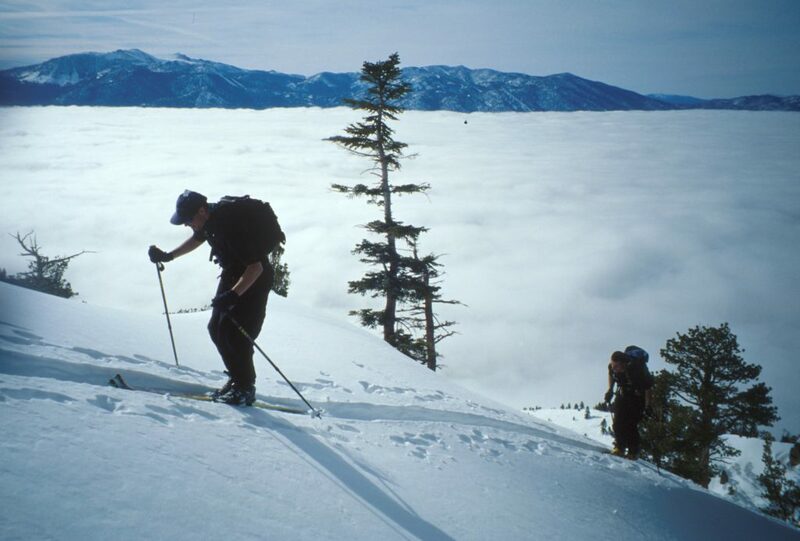 The Bliss Peak ski tour is an important one to protect public access to by restoring the parking area which was mostly REMOVED a few years ago by TRPA and Cal Trans. These two organizations did not contact any skiers, ski shops, or guide companies for their comments! There was a large PAVED pullout that was reduced to about 20% by removing asphalt and installing large boulders that prevent further plowing. Now you can park about 5 cars parallel to the highway. There used to be room for 15 cars or more. 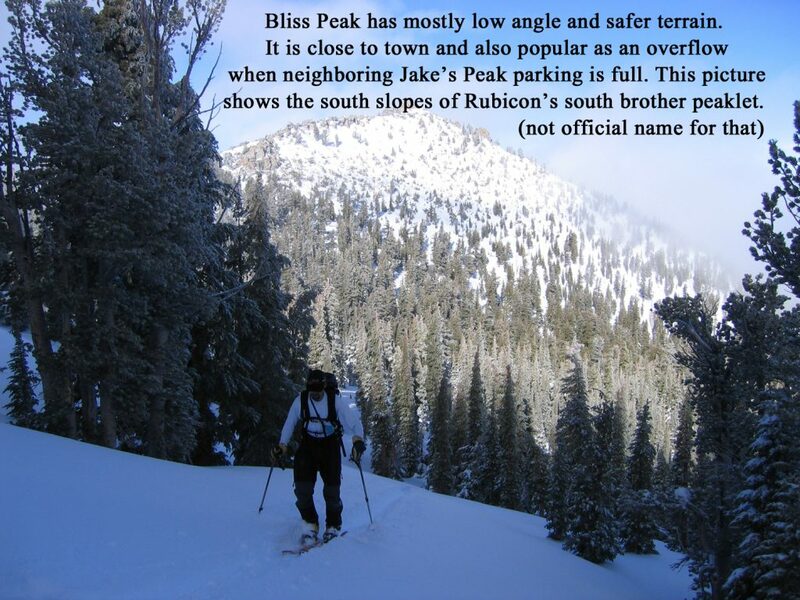 Bliss Peak offers a rare opportunity to ski mellow terrain near town and near the highway. This was quite popular also for its overflow capacity to allow skiers something to do when neighboring Jake’s Peak parking gets full. That happens on most sunny days after 10am when the skiing is good. 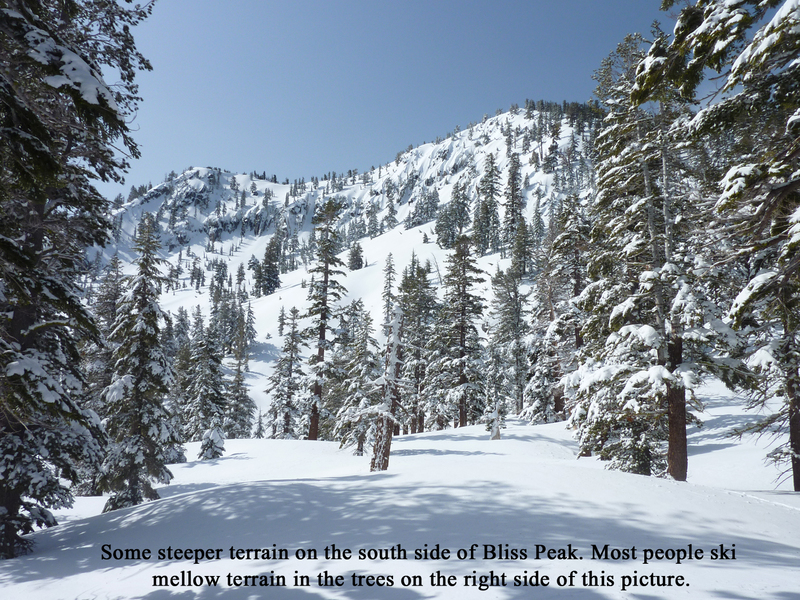 Bliss Peak has mostly low angle slopes in a mature forest, which provides for relatively safe skiing after new snowfall. The view from the top is not great, and it gets tracked out quick. It was still a great beginner ski tour that now is practically abandoned, because the narrow highway pullout that Cal Trans plows just looks like you might get ticketed or towed. Locals approached TRPA BEFORE they made these final changes, when the earth moving equipment was still sitting on site. This error in wiping out important public land access parking could have been easily reversed. We never heard any land managers comment at all. 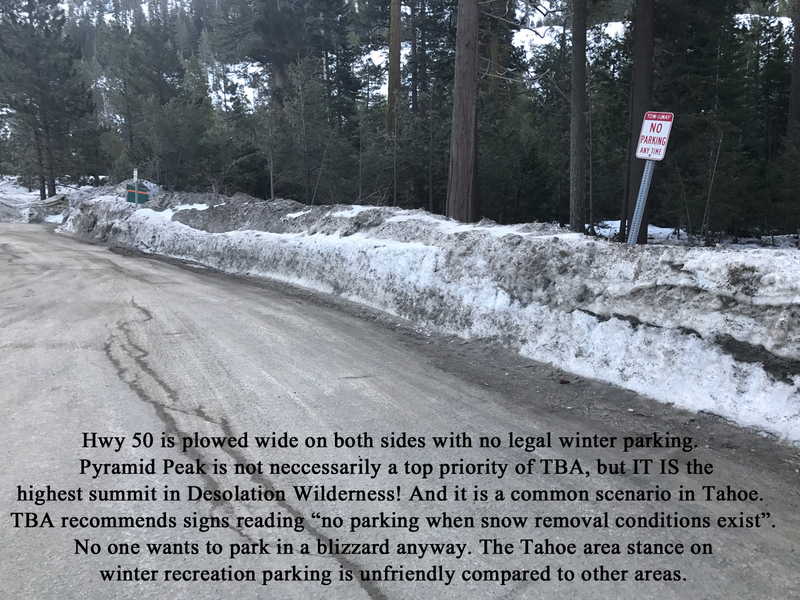 Contact TRPA and ask them why no balance between asphalt coverage and recreation needs is considered at all in Lake Tahoe. Their job is to manage BOTH. TBA would like to see the boulders pushed away and the previous parking opportunity restored. We are sure the water runoff issue can be mitigated by design. It was a fairly flat parking area at the edge of the forest and fully paved before.